The great Serengeti wildebeest migration is the movement of vast numbers of the Serengeti’s wildebeest, accompanied by large numbers of zebra, and smaller numbers of Grant’s gazelle, Thomson’s gazelle, eland and impala. These move in an annual pattern which is fairly predictable. They migrating throughout the year, constantly seeking fresh grazing and, it’s now thought, better quality water. The precise timing of the Serengeti wildebeest migration is entirely dependent upon the rainfall patterns each year – here we explain how the broad pattern works. The short rains begin around early November. A little after this in late November and December, the herds of the wildebeest migration arrive on the short-grass plains of the Serengeti. These are south and east of Seronera, around Ndutu and include the north of the Ngorongoro Conservation Area. Dispersed across these plains, wildebeest and zebra are everywhere – feeding on the fresh, nutritious grasses. They stay here through January, February and March, with most wildebeest calves born in a short window around February. Gradually they spread west across these plains, then around April they start their great migration north. By May the Serengeti’s wildebeest all seem to be moving north, migrating to seek fresh grazing and water. The area around Moru Kopjes and west of Seronera is then hectic with a series of moving columns, often containing hundreds of thousands of animals – joined by many zebra, and a scattering of Thomson’s and Grant’s gazelles. Some of the migration then head due north of Seronera, but most are usually further west. Around June the wildebeest migration is often halted on the south side of the Grumeti River, which has some channels which block or slow their migration north. The wildebeest then congregate there, in the Western Corridor, often building up to a high density before crossing the river. The river here is normally a series of pools and channels, but it’s not continuous – and so whilst they always represent an annual feast for the Grumeti River’s large crocodiles, these aren’t usually quite as spectacular as the crossings of the Mara River, further north. The wildebeest migration continues moving northwards during July and August, often spreading out across a broad front some heading through Grumeti Reserve and Ikorongo, others north through the heart of the Serengeti National Park. September sees the herds spread out across the northern Serengeti, where the Mara River provides the migration with its most serious obstacle. This river gushes through the northern Serengeti from Kenya’s adjacent Maasai Mara Game Reserve. Watching the frantic herds of the wildebeest migration crossing the Mara River can be very spectacular; there are often scenes of great panic and confusion. It’s common to see herds cross the Mara River north on one day, and then back south a few days later. By October the wildebeest herds are migrating again with more accord: all are heading south, through western Loliondo and the Serengeti National Park’s Lobo area, returning to the green shoots which follow the rains on the short-grass plains of the southern Serengeti in November. Then the whole Serengeti Wildebeest migration starts again. The Serengeti National Park itself covers about 15,000km² of mostly flat or gently rolling grasslands, interspersed with the occasional rock outcrops, or kopjes. But this is just the centre of a whole ecosystem which covers more than double that area, and includes Grumeti Reserve, Ikorongo Game Reserve, Loliondo Controlled Area, Maswa Game Reserve, part of the Ngorongoro Conservation Area and also Kenya’s relatively small Maasai Mara Game Reserve. This combined area is often referred to as the Greater Serengeti area, or the Serengeti-Mara ecosystem. Vast short-grass plains cover the south of Serengeti National Park, stretching into the north of Ngorongoro Conservation Area, the south-west Loliondo and Maswa Game Reserve. Occasionally there are small kopjes which, like the forests around Lake Ndutu, harbor good populations of resident game. However, around these oases of permanent wildlife, the majority of this area is flat and open. It’s alive with grazing wildebeest from around late-November to April, but can be very empty for the rest of the year. Places to stay here include. Stretching from Seronera for about 100km north, to the Kenyan border, the northern Serengeti is gently rolling country, broken by small rivers and occasional hills and kopjes. There are good permanent populations of wildlife in several areas here, including the very beautiful Lobo Kopje. It’s interesting, varied country that’s far from the park’s main entry point in the south – and hence it receives delightfully few visitors. Singita Grumeti Reserves covers almost 1,500km² of private reserves which run along the north side of the Western Corridor. Within this are three, very different luxury lodges. All offer unrivalled exclusivity for watching the migration as it journeys north, and recycle all of their profits into local conservation and community development initiatives. 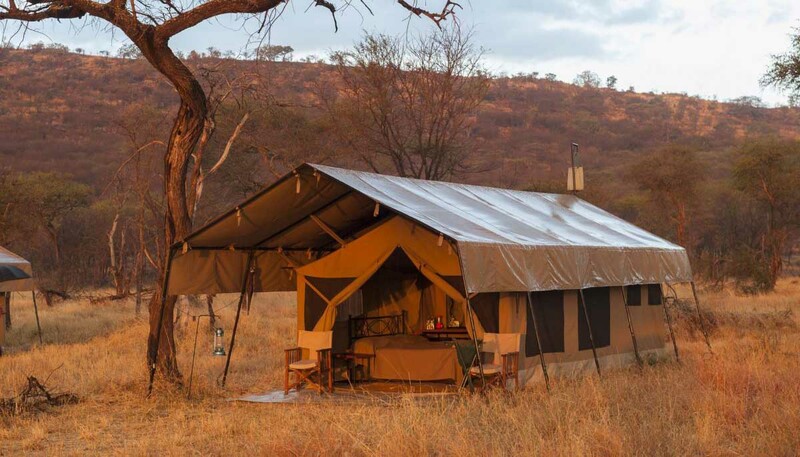 There are several semi-permanent mobile tented camps in the Serengeti. Most move seasonally, trying to anticipate the great migration’s movements; they spend several months in one place before moving on with the game. Their creature comforts vary from basic tents with adequate food, to very comfortable camps that feel almost permanent. 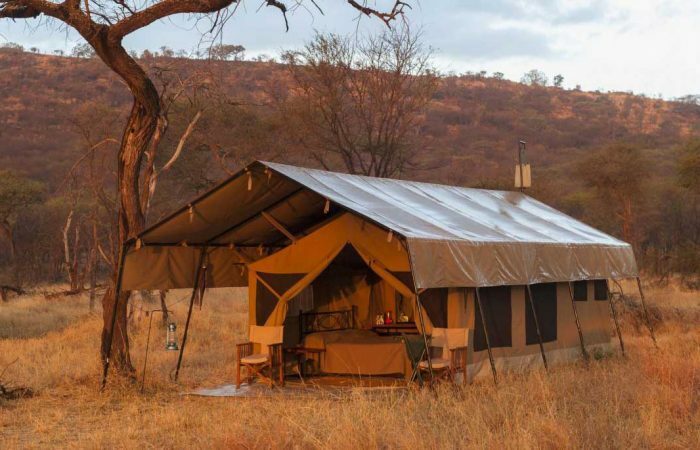 Such tented camps can be included as part of private guided safaris. Sadly, the Serengeti doesn’t always live up to its potential. It’s easy to end up with a herd of vehicles around you, destroying any sense of wilderness. It’s tempting to opt to rush around on dusty, corrugated roads with little time to stop. It’s also easy to simply miss the migration, which isn’t nearly as predictable these days as many will tell you. Because of this, planning a safari here can be complicated we need to guide you to choose the right camps at the right time of year, and get the best experience possible – especially when the wildebeest migration does vary every year. Copyright 2018 Raja Tours. All Right Reserved.